This wonderfully made Australian children's series features everything children and parents alike need to see and hear in a well made edutainment production. In this series, there are four DVD's that include "Body Jiggles" (This review), Favourite Rhymes, Fun and Games and Animal Adventures. So who exactly is the Smartcookie gang? They are a collection of colourful and quite loveable animal puppets that of course include Australian animals which include Flossy the Emu, JJ the Kangaroo, Squeak the Echidna and our favourite Ted the Koala. Best of all, the characters are quite well made and dance around that will definitely hold your child's interest as they sing and dance their way from the start to the finish of this DVD. In this current installment, "Body Jiggles", the Smartcookie gang will teach children a variety of useful life skills from teaching them the different parts of the human body and also other skills such as good personal hygiene from washing your hands to using a toothbrush. 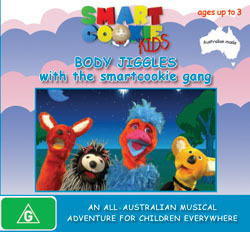 As these puppets dance and sing, children will immediately become captivated and eventually join in with the Smartcookie gang. We could recommend this DVD to all parents and best of all, it's Australia made!